Helper Columns are extra columns, that you can add to your tables without them being part of your product data. They are easily recognized through their bright yellow column headers. You can either enter formulas or text inside them and use them either as a one-time solution or save them in presets for re-use. You can further use them to split up formulas to intermediate steps, so even complex tasks stay comprehensible and verifiable. Text inside helper columns makes most sense when you create presets for single tasks, i.e. a preset for your translator: given the bright yellow START and STOP, he knows where text attributes are to be found for translation. Note: Helper columns reside only in cobby presets or your currently loaded sheet and are not part of your product data. You can differentiate helper columns form attribute columns by their bright yellow colour. 1. navigate to the column header right of the position where you want to add a help column, your cursor will then become a downward black arrow . 2. left click the column header, now the whole column will be marked. 3. right click the column and select Insert. A helper column will appear left of the other one. a) create your helper column wherever you like, then disable Data Validation for the helper column. 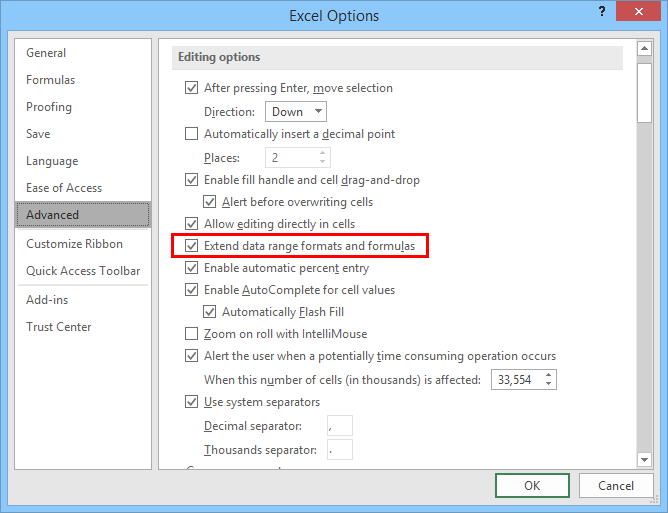 uncheck Extend data range formats and formulas. 1. Since only the first row is saved for all existing products in a table, create your formula in the first row of the table. 2. For later use, on all products in the table, you can pull down the formula with a double click on the lower right corner of the cell. The cursor will look like a ➕ when the correct corner is clicked.